Operation Gladio and the 'strategy of tension' in Italy beginning in 1969. Operation Gladio was organised by 'fascists' within the security services of the West. Reportedly, the idea was to kill innocent people and then blame this on others. Gladio was about keeping the right-wing elite in power. 'You had to attack civilians, the people, women, children, innocent people, unknown people far removed from any political game. The reason was quite simple: to force ... the public to turn to the state to ask for greater security." Italian Prime Minister Giulio Andreotti revealed the existence of Gladio in 1991. Parliamentary investigations in Italy, Switzerland and Belgium have given us a little of the truth. The book "NATO's Secret Armies: Operation Gladio and Terrorism in Western Europe," by Daniele Ganser documents some of what we know. Run by 'fascist' elements in NATO and the Pentagon, right-wing militias carried out acts of terrorism and electoral subversion in countries such as Italy, France, Spain, Portugal, Greece, Turkey and West Germany. Gladio was the name used in Italy. A Pentagon document, Field Manual FM 30-31B, details the methods for launching terrorist attacks. 85 people were killed on August 2, 1980 in the bombing of the Bologna train station. 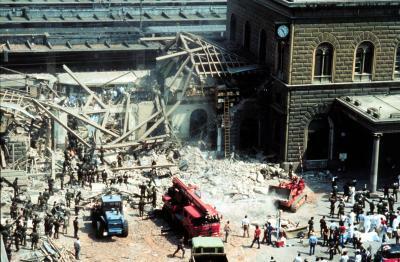 According to the Italian Senate, after its investigation in 2000, the bombers were later discovered to be "men inside Italian state institutions and ... men linked to the structures of United States intelligence." Reportedly, the Bologna bomb was part of Gladio's 'strategy of tension' - creating fear to keep populations in thrall to "strong leaders" who will protect the nation from the ever-present terrorist threat. The beginning of the 'strategy of tension' in Italy came in Dec. 12, 1969 when a bomb exploded inside the Banca Nazionale dell' Agricoltura in Milan's Piazza Fontana. 16 people were killed and 58 wounded. Reportedly, CIA chief Allen Dulles devised the plan to set up secret guerilla forces across Europe. Reportedly, Dulles, Sir Stewart Menzies(SIS) and the Belgian Premier Paul Henri Spaak were in on the plan. According to the newspaper Die Welt, western security services set up a committee to oversee the secret guerrilla forces. "Frightened by the 'opening to the left' under the Christian Democrat premiership of Aldo Moro and the success at the polls of the Communists who gained 25 per cent of the vote in the 1963 elections, the Italian right began to make plans to pave the way for the installation of a government of 'public safety' consisting of right-wing Christian Democrats, top managers and military men. "General Giovanni de Lorenzo, commander of the paramilitary carabinieri and head of the Italian secret services, together with twenty other senior army officers and allegedly with the knowledge and agreement of president Antonio Segni, drew up a plan for a presidential type coup d'etat. 'Plan Solo' was to have concluded with the assassinationof the premier, Aldo Moro. In an interview, an ex-Nato operative said that Ted Shackley, the CIA's deputy station chief in Rome, "fixed a meeting between Alexander Haig andGelli at the US embassy in Rome in the early 1970s, when Haig was PresidentNixon's Chief of Staff." Money, he said, was then filtered to Stay Behind or Gladio with the blessing and knowledge of both Haig and the then head of the US National Security Council, Henry Kissinger. Their aim was to prevent a communist takeover at all costs. Between 28/6/90 and 2/7/90, four programmes on Italian state television (RAI) alleged that the CIA paid LucioGelli to "foment terrorist activities. " In the first programme someone described as 'Agent Zero' described how (ex-Swedish Prime Minister) Olaf Palme had been caught in a deal between the CIA and Iran to release American hostages in Tehran. "Palme was a fly in the ointment so we gotP2 to rub him out," the agent said. The second programme, which showed the gaunt silhouette of 'Agent Zero One', alleged that P2 was not wound up in the mid-1980s, after the arrest of its leader Licio Gelli. "It still exists. It calls itself P7," he said. According to the agent, the lodge is till functioning with branches in Austria, Switzerland and East Germany. "In the programme, Mr Brenneke alleged that, throughout the 1970's the CIA had made large sums of money available to the subversive Masonic Lodge, P2,widely believed to have been involved in the August, 1980 Bologna trainstation bombing in which 85 people were killed. "Furthermore Mr Brenneke claimed that, not only does the CIA continue to secretly finance a revivedP2, but that it was involved in the 1986 killing of the Swedish PrimeMinister, Mr Olaf Palme. "According to Mr Brenneke, P2, under the guidanceof its Grand master, Mr Licio Gelli, used some of the finance made available by the CIA to set up agencies in West Germany, Austria andSwitzerland. "These agencies in turn were used by P2 to set up the assassination of Mr Palme, on the orders of the CIA. Finally, and perhaps most sensationally, Mr Brenneke alleged that President Bush, then directorof the CIA, not only knew about these CIA activities in Italy (during the late 1970s and early 1980s) but was in fact one of the masterminds behind them. "The paper [Milliyet] also quoted former Premier Bulent Ecevit as saying the unit had first been funded by the United States...During a wave of terrorism in the 1970s, leftist groups questioned the possible role of the organisation, also known as 'kontrgerilla', in right-wing terrorism." (Associated Press, 14/11/90)"
In other countries there would be uproar. Scaramella, the Naples Camorra, nuclear material.